Easter joy abounds at Marycrest Manor! The holiest days of the year are those that recount the tender love that Jesus has for each of us. At Marycrest Manor we celebrate the memory of these days with our residents and families in many ways. Our Holy Thursday Seder Meal recalls the Passover of the Lord and the forty year journey that the Israelites took through the desert paralleling our forty day journey through Lent. Then there is a resident washing of the feet and our Administrator, Sr. Mary Clare, lovingly cleanses the residents’ feet with great humility. Good Friday services include a passionate rendering of the Passion of the Christ and all those present are moved by the intense prayer and recollection of those present. Then Easter Sunday arrives and we celebrate the high Mass commemorating the greatest truth of our Salvation, the Resurrection. This is followed up with an intense Easter Egg Hunt! 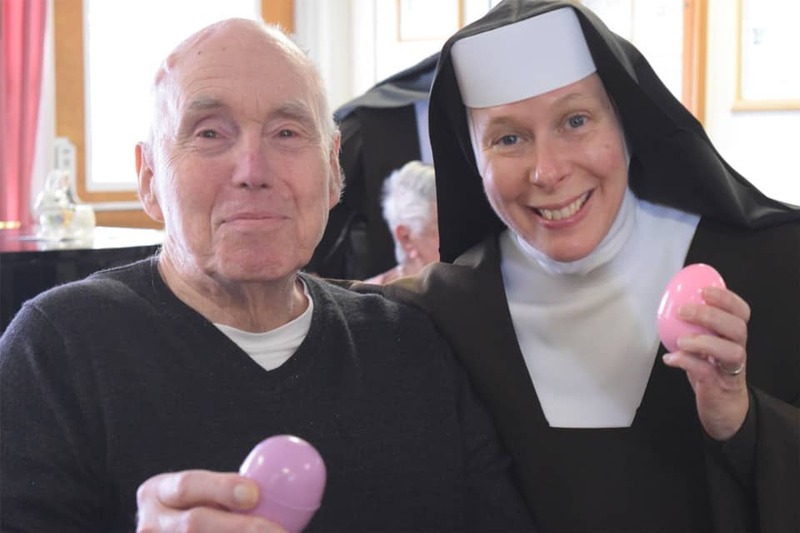 We hope you enjoy these pictures from the egg hunt and wish all of you a very Blessed Easter from Marycrest Manor! We hold you in our prayers!